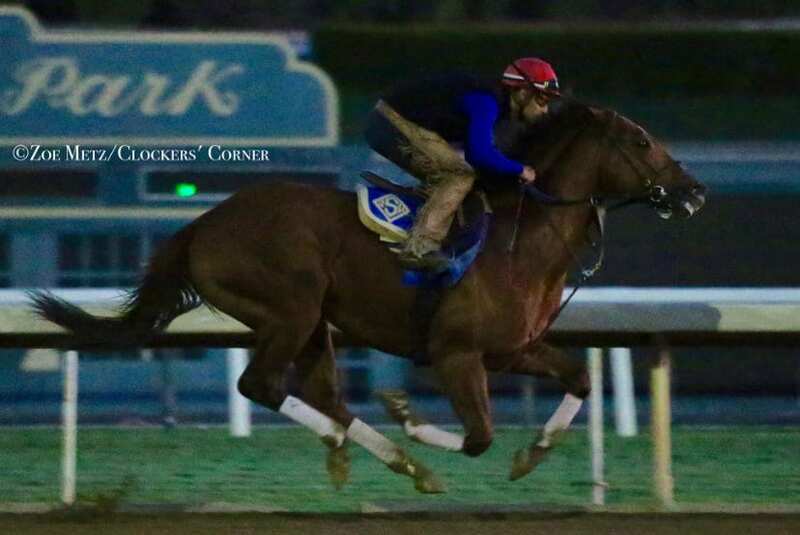 Breeders' Cup Classic favorite Accelerate had his penultimate workout at Santa Anita Saturday for the $6 million race at Churchill Downs Nov. 3, going five furlongs under assistant trainer Juan Leyva in 59.80. “He went very well,” trainer John Sadler said of the multiple Grade I winner owned by principal clients Kosta and Peter Hronis. “I had him in a minute flat, but we're splitting hairs there. He had another nice gallop out. I had him out (seven furlongs) in (one) 26. Michael McCarthy supervised drills for a quartet of Breeders' Cup candidates Saturday: multiple Grade I winner City of Light (Dirt Mile/Classic), five furlongs in a bullet 59 flat, fastest of 40 works at the distance, the average time of which was 1:01.07; Liam the Charmer (Turf), five furlongs in 1:01.40; Paved (Filly & Mare Turf), five furlongs also in 1:01.40; and Vibrance (Juvenile Fillies), five furlongs in 1:00.40. Gunmetal Gray, early third choice for the Juvenile, went six furlongs in a bullet 1:13.40 for Jerry Hollendorfer. It was the fastest of 11 works at the distance, the average time of which was 1:14.69. In all, there were 145 works at Santa Anita Saturday, eight on the training track. This entry was posted in Breeders' Cup and tagged accelerate, Bob Baffert, Breeders' Cup, breeders' cup classic, churchill downs, city of light, gunmetal gray, hronis racing, john sadler, juan levya, liam the charmer, paved, santa anita, vibrance by Ed Golden/Santa Anita. Bookmark the permalink.